During Sunday’s Miami HEAT game, Miami-based Carnival Corporation & plc and its flagship brand, Carnival Cruise Lines, presented full four-year college scholarships to local high school seniors who are participating in the company’s School to Work mentoring program operated in conjunction with the HEAT and Big Brothers Big Sisters. Each student also received a laptop computer, compliments of Hewlett Packard. The students are former graduates of the HEAT Academy, an after-school enrichment program for at-risk youth, and have been enrolled in the School to Work mentoring program for the past four years. The program pairs 78 students with members of Carnival’s management team who provide a first-hand look at the business world and real-life work experience. 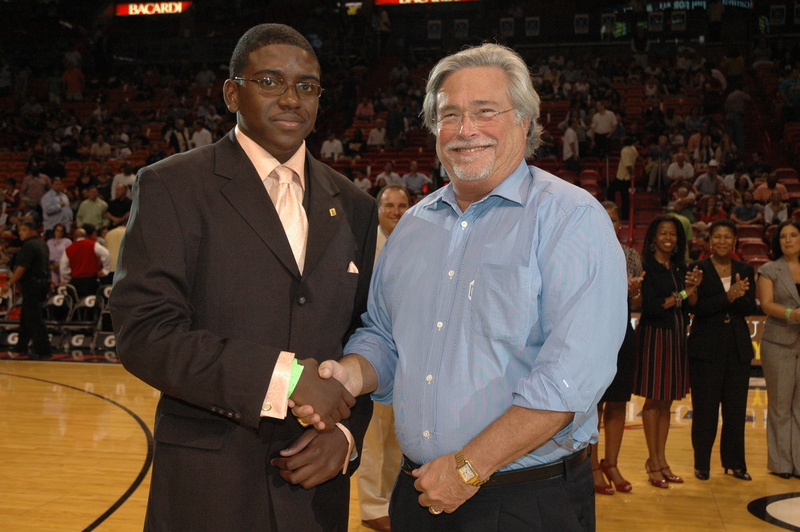 In the first photo, Dwayne Brown of Miami Central Senior High and Micky Arison, chairman and CEO of Carnival Corporation & plc and managing general partner of the Miami HEAT, are pictured at the halftime scholarship presentation. The second photo shows scholarship recipients with their mentors at center court. In the third photo, the students proudly display their new laptop computers provided courtesy of Hewlett Packard following the ceremony. The scholarships were purchased by Carnival through the Florida Prepaid Scholarship program, which matched the corporation’s contribution on a dollar-for-dollar basis. Scholarships were awarded based on academic performance and face-to-face interviews. Thus far, Carnival has purchased more than 120 scholarships with a collective value of more than $1 million. The company plans to continue awarding scholarships on an annual basis.